While the setting of Maligne Lake seen from the end of Maligne Lake Road road is stunning, the views on a Maligne Lake cruise are even better further down the lake, where glacial runoff turns the water an enchanting turquoise colour and mountain peaks seemingly jostle each other for lakeside superiority. 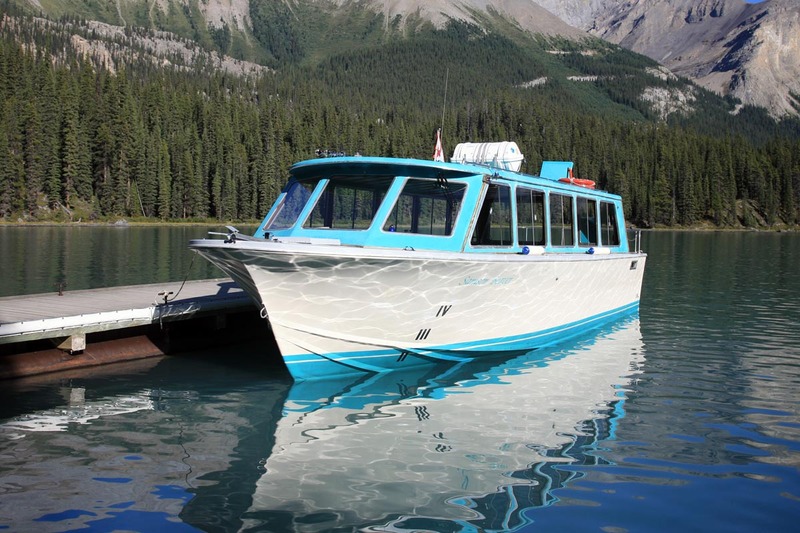 Which makes taking one of three different cruises operated by Maligne Tours, the only company licensed to operate on the lake, an absolute must. 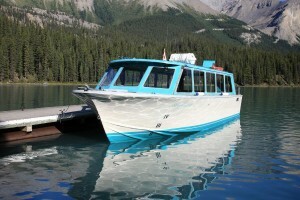 Covered tour boats make the trip on Maligne Lake enjoyable in all weather conditions. The boat tours to Spirit Island are hosted by a tour guide who is well versed on the natural and human history of the lake, with the a commentary starting as the boat departs the dock at what is locally known as Home Bay. Passengers hear of ancient rockslides that spread across the valley, the geology of prominent peaks is explained, and an overview of local wildlife is given. As the boat continues toward Spirit Island, the origins of surrounding mountains become more obvious as the guide describes their composition and pint out features such as the Opal Hills and fault lines. As the boat motors southward, a number of glaciers come into view, and the geology of these frozen rivers of ice clinging to the mountains is explained. Entering Samson Narrows (also called The Narrows), it is apparent how sediment runoff from the surrounding mountains has accumulated in the lake, contracting the lake width to just 100 metres (330 feet). Beyond Samson Narrows, the tour boats round a corner and famous Spirit Island comes into view. Here, the captain will turn off the boat’s motor, allowing passengers to step out onto the boat’s deck and soak up the 360-degree lake-and-mountain panorama. Pulling ashore at a dock beside Spirit Island, plenty of time is allotted to walk the short trail to the ideal vantage for a postcard-perfect composition of Spirit Island surrounded by turquoise water and with Mount Charlton rising dramatically in the background. The lookout over Spirit Island, a small isle of trees linked to the mainland by a low, rocky isthmus, provides one of the most famous vistas in the Canadian Rockies—and is surely one of the most recognized mountain scenes in all of Canada. In the early 1920s, James B. Harkin, Dominion Parks Branch commissioner, contracted Calgary photographer, William J. Oliver to take photographs of the Canadian Rockies as part of a publicity campaign to entice tourists to the mountain parks. The most recognizable of the Oliver photographs is a sepia-toned photograph featuring Spirit Island with a birch canoe and a tepee. This highly stylized image created a romantic visual that left viewers with an impression of Maligne that was remote, wild, and connected to Aboriginal mysticism. Renowned Banff photographer Byron Harmon visited the island in 1924, staging a photo shoot that also used a tepee. In the 1940s and 50s, local photographer Harry Rowed became known as much for his large-format images as his popular postcards that were sold at his Jasper studio. Rowed often called the island F11 for the camera setting which produced the best photographs. It wasn’t until the late 1960s that the name Spirit Island came into widespread use. 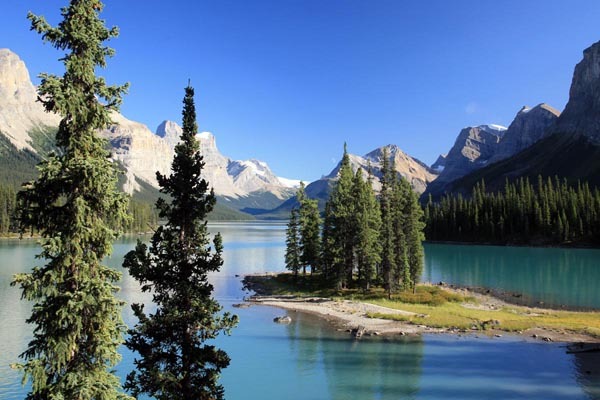 Although the name is now inextricably linked to the beauty of Maligne Lake and Jasper National Park, its origin is not known. One story involves the nephew of Lewis Suzette Swift, who homesteaded in the Athabasca River Valley in the 1890s. It was said that the young boy became sick and died on a hunting trip to the lake and is buried on what the family began calling Spirit Island. After leaving Spirit Island, the tour boat returns to Home Bay. The official commentary has been completed—this part of the tour is great opportunity to sit back, relax, and soak up the scenery. 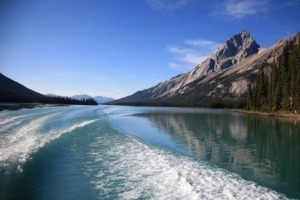 The Classic Scenic Cruise runs multiple times daily between early June and early October, weather permitting (early season sailings depend on when the lake becomes ice-free). Tours depart daily on the hour between 10 am and 4 pm, with an additional 5 pm, sailing in July and August. The cost is adult $64, child $32. For the best chance of enjoying calm water and less crowds, plan to join an early morning or late afternoon cruise. The two-hour Family of Explorers Cruise departs early July to late August every Sunday, Tuesday, and Thursday at 1:30 pm. The focus is on the younger generation, with on-board activities and an on-shore scavenger hunt upon arrival at Spirit Island. The cost is adult $75, child $38, and free for those under five. Maligne Lake’s Spirit Island is one of the most photographed spots in the Canadian Rockies, which makes the 2.5-hour Through the Lens Cruise popular with photographers of all levels. It features a running commentary and tips by a local professional photographer, additional time spent on Spirit Island, and on-board afternoon tea. Departures are July to late August every Tuesday, Thursday, and Sunday at 4:30 pm and between late August and mid-September every Tuesday, Thursday, and Sunday one hour later at 4:30 pm. The cost is $145 per person. Advance reservations for all tours are highly recommended, especially for July and August departures. Make these at the Maligne Tours downtown Jasper ticket office at 616 Patricia Street (780 852 3370 or 866 625 4463), or out at the lakeside ticket office, or book online at www.malignelake.com.